I’m a bit like a bus-stop in winter when it comes to posts this evening, I’m afraid. None all last week, while I was attempting to finish up some work, and now several posts (buses, in this metaphor) come along on each others’ heels. Not shown: two novels by Deborah J. Ross, which I have already read and shelved, and MIRROR SIGHT by Kristen Britain, which has been misplaced during shelving triage and may be under my bed. 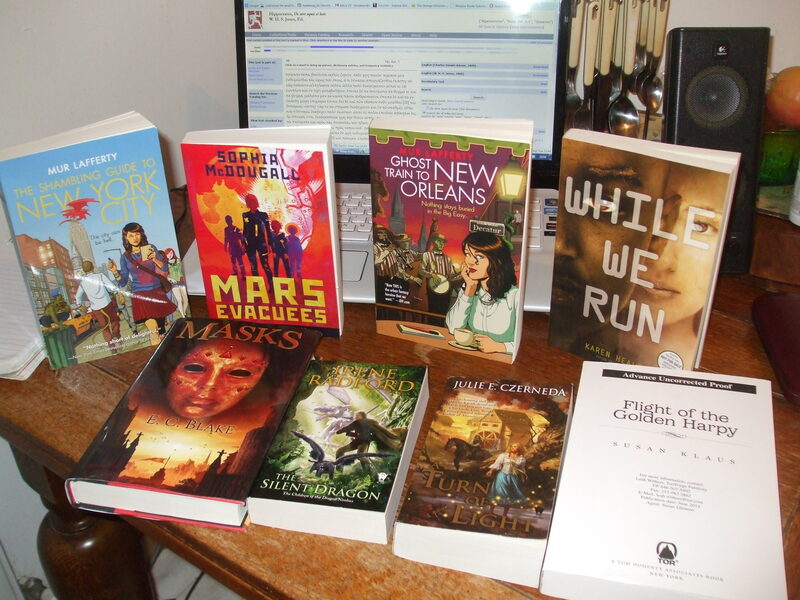 In no particular order, Sophia McDougall’s MARS EVACUEES, Karen Healey’s WHILE WE RUN, Julie E. Czerneda’s A TURN OF LIGHT, Mur Lafferty’s THE SHAMBLING GUIDE TO NEW YORK CITY and GHOST TRAIN TO NEW ORLEANS, debut author Susan Klaus’s FLIGHT OF THE GOLDEN HARPY, E.C. Blake’s MASKS, and Irene Radford’s THE SILENT DRAGON. There are also a couple more electronic ARCs in my inbox. I’m most excited about P.C. Hodgell’s THE SEA OF TIME. This entry was posted in SFF and tagged books, E.C. Blake, Irene Radford, Julie E. Czerneda, Karen Healey, Mur Lafferty, P.C. Hodgell, pictures, Sophia McDougall, Susan Klaus. Bookmark the permalink.